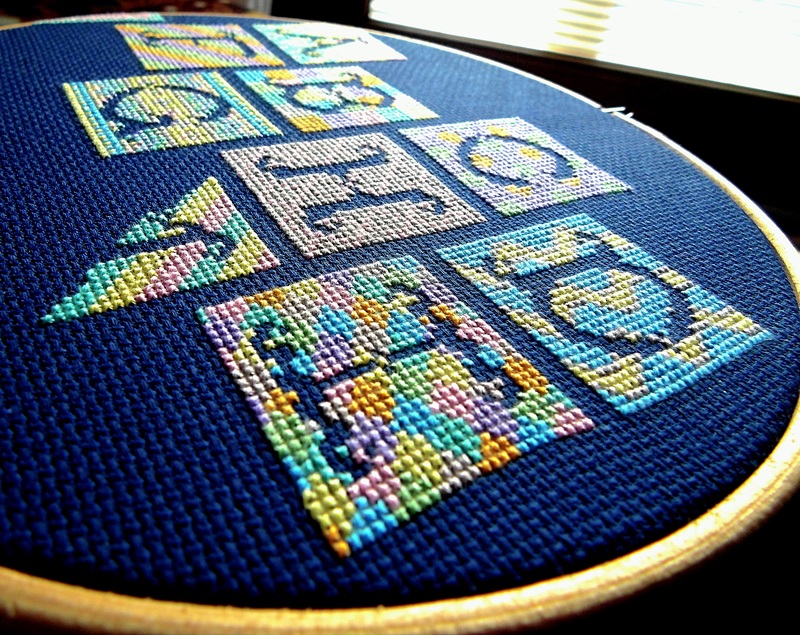 I mentioned last week that in recent months I have learned to love cross stitch again. 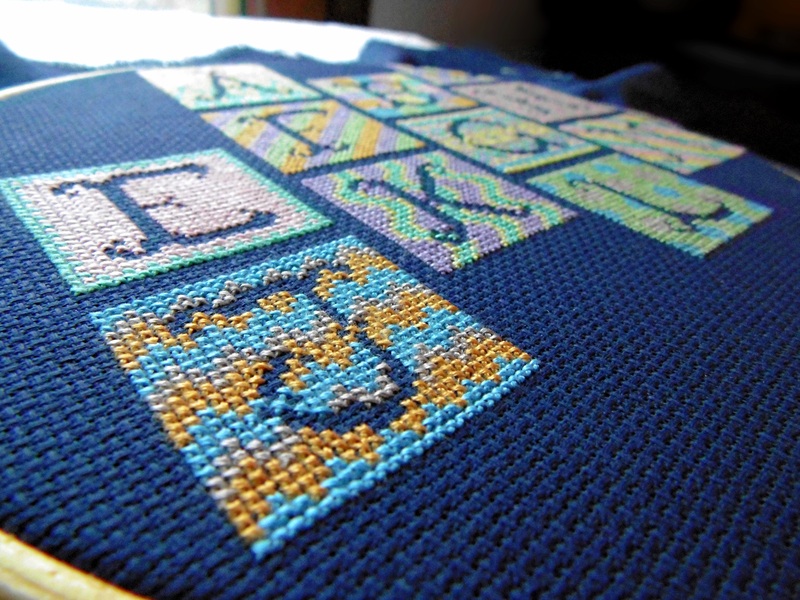 I have to admit I’d previously got a bit snobby about cross stitch and had focused entirely on other forms of embroidery. I do think part of the problem was because a lot of shops that supply embroidery kits only offered cross stitch and a lot of them were, dare I say, a bit twee. At least, they weren’t to my taste and didn’t inspire with to start stitching. 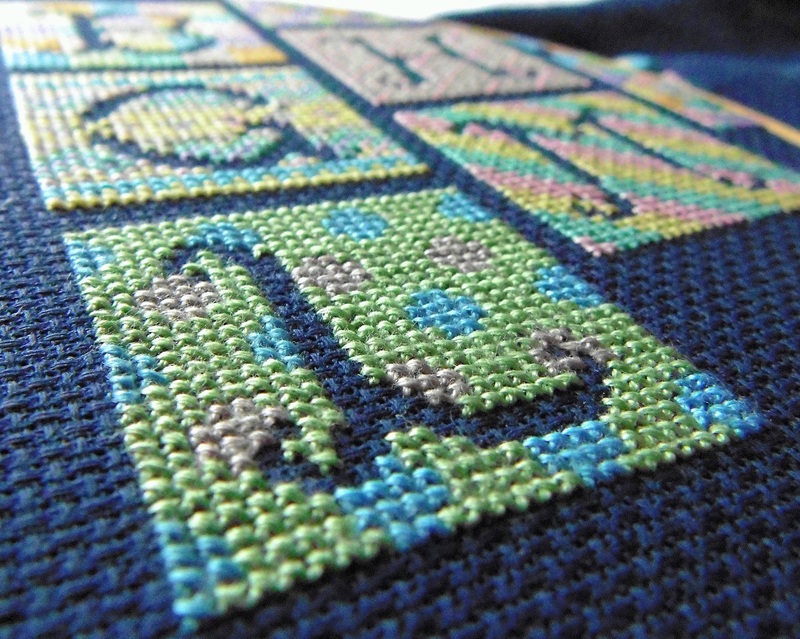 Now I am trying to create embroideries of my own design, I have come to appreciate cross stitch all over again. It is the perfect form for my fair isle inspired patterns. I have found it bold and vivid and a great way to play with colour. All of this, and my work creating shapes using negative space gave me a new idea. 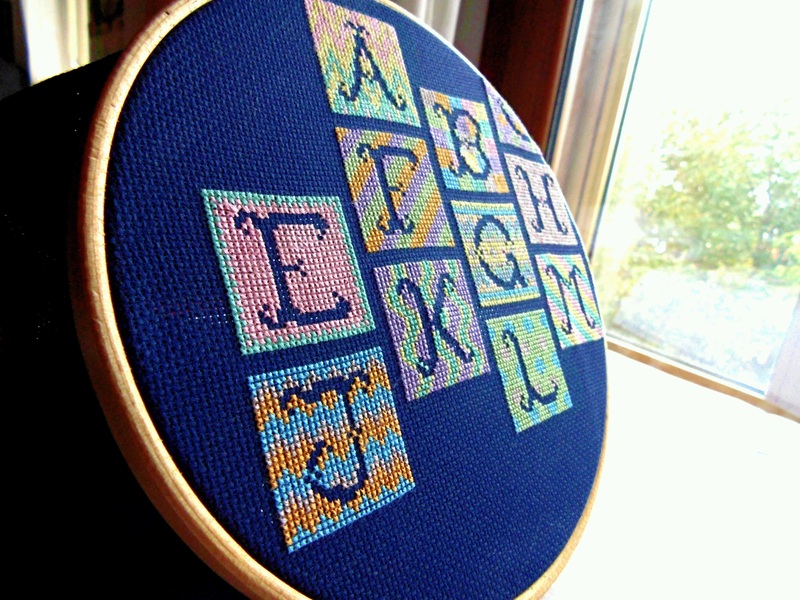 I decided to create a patchwork of lots of little cross stitch patterns and making them into an alphabet sampler. I chose a bright but slightly softer palette of colours for this project. In all there are eight colours but if I were to do this all over again I think I would throw in a couple more – twenty six patches plus a couple more to even the whole shape up is quite a lot to cover! I have created the letters by, again, leaving a negative space. (I do seem to love negativity – I am not sure what that says about me!) 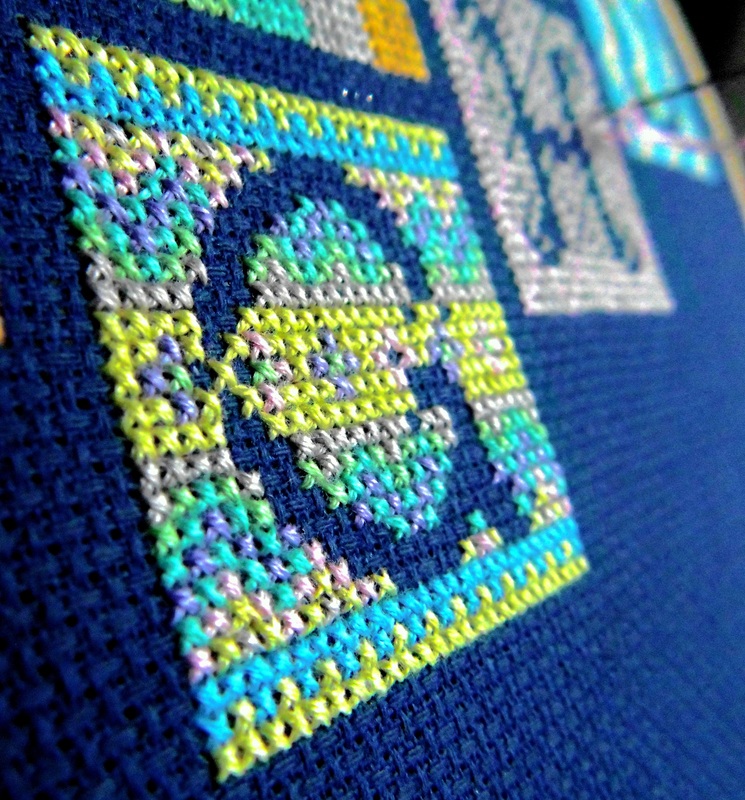 I love to watch the shapes emerge as all of the tiny stitches are added and gradually cluster around it. I have repeated a couple of the patch patterns but have ensured it all stays looking quite random by switching the colours around. Of course, I had to throw a little fair isle pattern in for good measure! This is my “bubbling away in the background project” that I pick up and put down at will. It is the one I will take with me when I am out and about on the off chance that I will have a chance to stitch. Therefore, it could be a while before it is finished, but I will keep you posted! If designing your own patterns isn’t your thing, I just wanted to mention that I have started to source some “non-twee” cross stitch kits that you can buy online. 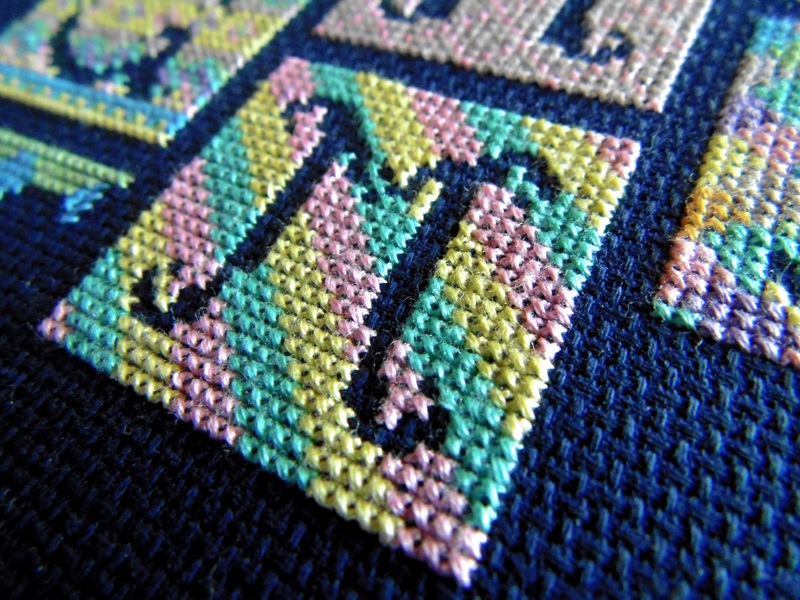 One that I do rather like is the Historical Sampler Company. They have a wide range of lovely patterns but they also offer their kits on Aida or 32 count linen which is a big selling point in my opinion. Whilst I work on Aida for projects I am trying out (like this one) or where the stitching is so dense you can’t see the backing fabric I do love to present work on linen. This is not a sponsored post, I just wanted to share something I have found useful.